The Uppu people fall under the larger ethnic grouping of Chin. 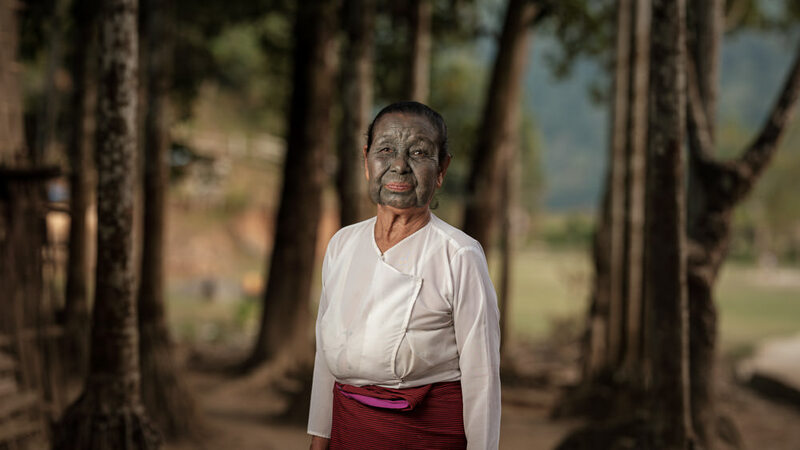 Like many of the Chin peoples, they had a facial tattooing practice in place for their women in the past. Very few Uppu women with the tattoo now survive. The Uppu, unlike some other Chin tribes, live scattered around the various tribal areas. Some villages may be found nearby Mindat and others along the Tin River. Also unlike the majority of the Chin tribes, the Uppu are primarily Buddhist. Animist traditions are all but non-existent for them and Christian missionaries were unable to convert the majority of Uppu people. Their completely black faces may be what defines them at first site, but the Uppu have maintained a different set of traditions to their neighbours over time. One large difference in their history was their proximity to other ethnic groups and the trade that came from that. The Uppu were known as great blacksmiths, a trade which they learnt from outside. They had contact with some highly skilled blacksmiths, which can be seen from the tattoo-faced ladies’ recollections of an iron tattoo tool that self dispensed the ink as they were tattooed (much like a tattoo pen).